Coil Splitting is a simple, usable way to add another dimension of tone to your guitar. You can essentially double your tone, with a flip (or pull) of a switch. You can use this to clean up a beefy humbucker, or get your tone to “cut through” a lot more. If you want to understand what’s going on when you split your humbucker, read on! Let’s look at the above image. 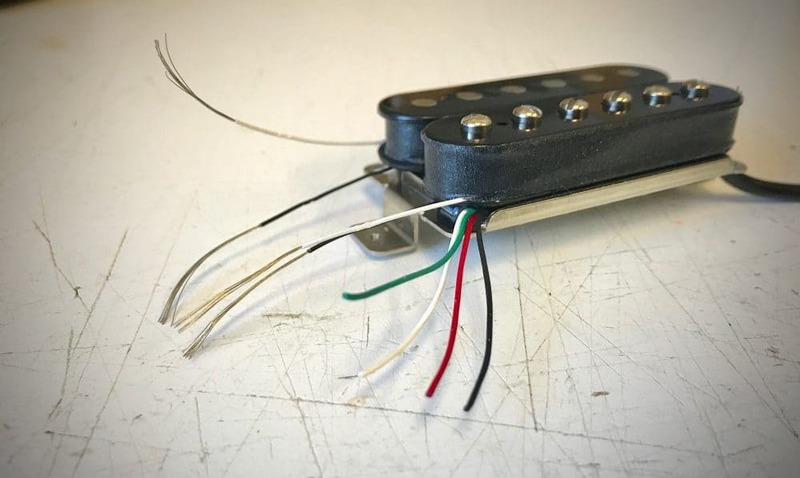 As you can see, a normal humbucker is wired by connecting the Outside Leads of each coil together, and sending the Slug Inside Lead to ground, and the Screw Inside Lead to the switch (hot). Note that you need to have either 3-Conductor Wiring or 4-Conductor Wiring to split a humbucker. These conductors have each coil it’s separate output, all the way down the lead. If you have a humbucker wired with Gibson lead, your humbucker is already wired like this. There’s no way to split the humbucker with a Gibson Lead. You’ve connected the Red Lead of the Slug Coil to ground. As the Black lead of the Slug Coil has already been connected to ground, this means the entire coil is connected to ground. You’ve also connected the Green Lead of the Screw Coil to ground. This allows the Screw Coil to remain functional. As you can see, when the push pull pot is in the down position, the Red and Green wires are still connected together, and not connected to anything else – the humbucker is in full-functioning mode. When you Pull Up: Both the Red and Green leads are now connected to a ground jumper to the casing of the pot, sending the finishes to ground as illustrated above. Depending on the lead you have, and the set-up you want, there’s a few options you can perform. On a 3-Conductor Lead, the Tap (coil finishes) are coded Red. On a 4-Conductor Lead You have Red and Green As the coil finishes. Let’s look at the bottom two images. These are two separate humbuckers being tapped by the same push-pull pot. As soon as you pull up, both humbuckers will be split at the same time. If you want independent control over your humbuckers, you need to use two separate push pull pots, one for each humbucker. Note: In the first two examples above, we’re using the “left” side of the switch. It really doesn’t matter which side you use – as long as the Ground connection is above it. Well, that’s all for now. Stay tuned next month for our next article on Resistors in guitars, and Happy New Year! 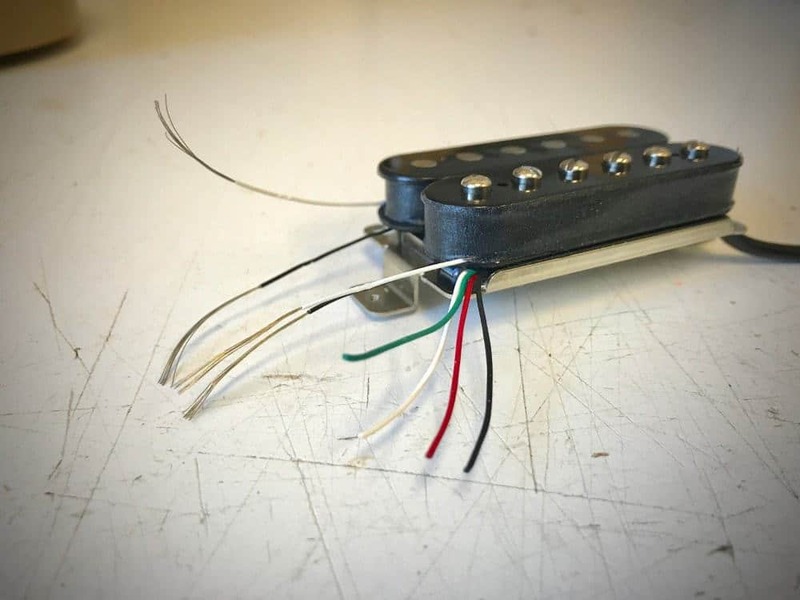 The generic image for this specific webpage shows a humbucker, out of which, aside from the 4 conductors, 2 more conductors out of each coil show up: a black one & a white one. There are 8 leads in that image – 2 from each coil (start and finish), and the 4-Conductor wire, ready to be wired up. In this case, our Humbucker Tech would wire each appropriate Coil Wire lead to the corresponding 4-Conductor Lead, allowing you to solder in easily. Hey Tyler, I have a set of active humbuckers (Tesla AH-4) with 4 conductors which Im thinking about putting into a schecter guitar with a push-pull pot. My question is, is it possible to coil split active pickups? Based on your humbucker’s specifications, I don’t believe it’s possible to split these. Green + Shield = Ground, White + Black = Hot (slightly confused on this), and Red is the DC power. I don’t believe you can split these, sorry. Hey thanks for the awesome article, but i still have a doubt… I am looking foward to make this wiring in my Semi-Acoustic Condor JC- 501 but i’m suspecting that i’ll have to replace the pick-ups, cause there is only one cable getting out of the each humbucker with white and black wiring inside (i supose it is one ground and one hot). So therefore i would have to buy a set of pick ups that have 4 wires exposed? Or i can still do this with my actual pick ups..? 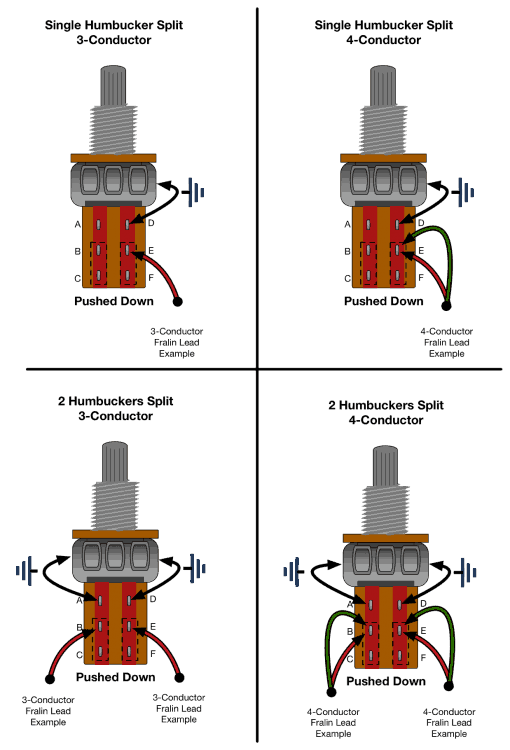 Yes – you need at least 3-Conductor lead to perform the Coil Split modification. You simply can’t separate half of the pickup with 1 or 2 leads. Tyler, GREAT explaination of coil splitting. The pictures are worth a thousand words! I have a PRS SE Standard Santana with StewMac Golden Age humbuckers. I installed a push/pull on the tone control and, instead of going straight to ground when pulling the switch up, the signals from the 4 wire pickups (red and green) go through a 2.2k resistor to ground. This has the effect of leaving some of the grounded coil in the circuit making the volume difference less obvious, and still getting a really sweet single coil sound. I’ll be the 2.2k resistor values will be different for pickups with different overall resistive values, but some experimenting might yield some unexpectedly delicious results. Hey Tyler, I’m trying to use a blender pot to blend a HSS strat humbucker. I have a 4-conductor wire but am not sure which leads attach to the starts and finishes of the bobbins, especially since I want the active single coil (when the humbucker is blended out) to be on the slug side, not the screw side. Any ideas? If you have a Fralin humbucker – with our color codes – you simply reverse the entire coil direction to make it split and keep the slug coil. So, Black would be Hot, White would be ground, and Red and Green get tied together.